The Benefits of Meditation - How Can Meditation Benefit You? I’m so glad you’ve come across this page because the benefits of meditation are definitely worth taking a minute to understand and appreciate. "Scientists study it. Doctors recommend it. Millions of Americans - many of whom don't even own crystals - practice it every day. Why? Because meditation works…"
Many of us think of meditation as a spiritual practise that is reserved for monks that live in monasteries, but in reality, meditation is a simple and accessible practise that anyone can enjoy and benefit from. When you discover the benefits of learning how to meditate or listening to a guided meditation download, it's little wonder that meditation continues to grow in popularity every year. 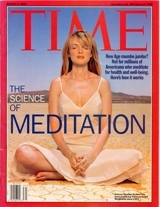 Want to read some REAL accounts from people who have introduced meditation into their lives? What better way to explore the benefits of meditation than to learn from the experiences of others. Meditation really is the ultimate stress-buster . . . and we all know that stress is one of the biggest killers in the world today, so it’s a fair claim to make that meditation saves lives. But meditation is so much more than that. Let's face it, most of us are NOT motivated to meditate because we are trying to avoid a heart attack, we just want to live better lives . . . lives with more happiness, more love, more peace, better health and more fun. Meditation is the answer. It would be easy to assume that meditation is just a mental exercise and that the benefits of meditation are limited to the mind only, but stop for a moment and consider the fact that your mind and your thoughts are connected to every other aspect of your life. Your thinking effects your emotions, and your emotions affect your physical body. You are a connected being . . . your mind, your physical body, your emotions and the spiritual dimension of your life are all intertwined. Meditation does not have to be a spiritual experience for you, but if you so choose, then the spiritual dimension of your life may blossom through meditation. Experienced meditators often describe feeling a blissful wholeness and a deep inner connection to all life. Incredible depths of inner peace - peace that is beyond all understanding and description - lies within us all, and meditation is the key to awakening this unfathomable dimension of freedom. Your life as a whole - The biggest benefit of them all! As you can see, meditation benefits every aspect of your being . . . mental, physical, emotional and spiritual. Now there is a profound insight to be had at this point. . . .
How you feel and what you think determine almost every decision you make in life. Who you are in this world, and how you respond to the experiences that come your way are all influenced by the content of your mind. Therefore any activity (such as meditation) that improves the quality of your thinking and feeling will have a positive effect on your entire life path. If you really stop to think about it for a moment, you begin to realize just how much of a difference meditation can make to how your life will turn out! Sometimes, the line between a great success and a monumental disaster is a seemingly insignificant little moment in which you give birth to a thought and make a decision . . . the moment when you decide to turn left or turn right . . . the moment where you choose between a peaceful response to a situation, or an angry one . . . the moment when you notice the attractive smile of the person across the room, or the moment when you miss that smile, that chance meeting, that new love. All of life is filled with these "opportunities to choose". Some are more significant than others, but all of them add up to the path that you will one day call "my life story". So this, to me, is the ultimate gift that we stand to receive from meditation. Meditation transforms the very essence of who you are in this world. It transforms your thoughts, your feelings, your choices and also your experiences. Your success, your health, your relationships . . . every aspect of your life will be enhanced when you start to experience life through a clearer and more positive lens . . . once you start to meditate. So now you know a little bit about the benefits of meditation, click here to find out more about the benefits of guided meditation, or click here to step into meditation now. Healing meditation is an energy healing therapy that promotes natural healing. If you don’t like bombarding your body with pills and aggressive medicines, discover more amazing breakthrough energy healing therapies.